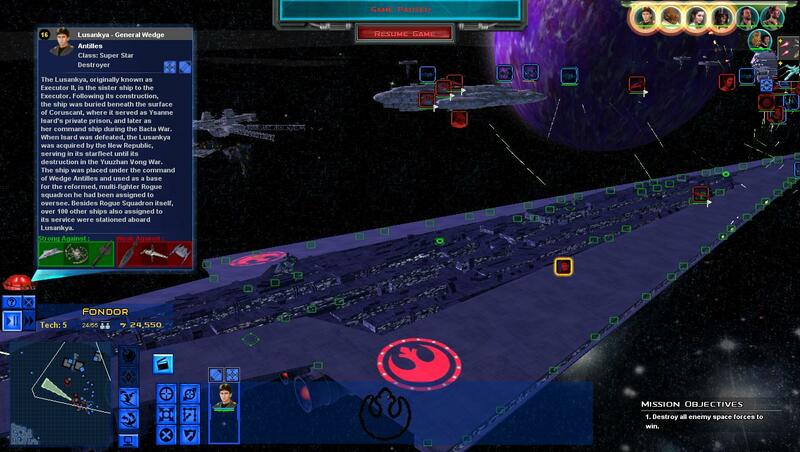 Same mod, different name, The Galactic Empire, the Rebel Alliance, the Black Sun Pirates, and the Droid Empire, fight for control of the galaxy. Credit goes to War Lord Link for the Lusankya reskin from his Model Rerig Pack. TBH, i don't like the Executor-class. it's more of a terror weapon then a practical warship. you could be more effective with a small group of ISD-2's, with supporting vessels. the Main Battery of an ISD2, a trio (sextet, but only 1/2 the batteries on each side) of Octuple-mounted Heavy Turbolasers and a (pair of) Octuple Heavy (turbo)Ion Cannon. combine this with the rest of the armaments package, the fighter compliment, and formidable protection and you get a vessel that is more than capable of dealing with many threats. the Executor, in my mind, is little more then a tool for show. while extremely powerful, they are too few in number. they are extremely resource intensive compared to the standard Imperial classes, and are simply wasteful. i remember reading somewhere that at any one time, only 8 weapon emplacements could be brought to bear on a single target. at first i doubted this, but then some scenarios made sense. and for such a powerful ship, that members of her class were rendered inoperable (destroyed, captured, etc), with such ease is appalling. you had the namesake get taken out after a short bombardment by enemy capital ships, followed up by a strafing run by a pair of A-wings, then you had Lusankya rendered disabled by a pair of ISD-2s, a light cruiser analogous to a Carrack, a group of freighters, and ~5 squadrons of fighters. Maybe you can make it deploy rogue squadron. you should have it only buildable if rogue squadron is in orbit around thyfera and once it's built it should replace rogue squadron and be able to deplay it? Since most of the mod is Fanon, why not? The Lusankya will be designed to be superior to the Empire's Executors, due to the Rebellion's upgrades to the ship. It will also be equipped with lasercannons for use against starfighters. Wookieepedia says this is something the Lusankya was built with since it was designed to focus on planetary occupation without a need for supporting vessels. The Lusankya can be built if the Rebels control Thyferra. It will be commanded by Wedge, which means there will be two of him. I know that weird, but he was the more well known commander. Adding the Lusankya should balance things out, but if needed, I might add the Guardian. And yes the Empire has more SSDs, but the chances of seeing another isn't very high, except for the Executor itself. Also the Annihilator no longer spawns in at Tech 5, it has to be built now. Besides those are the Reaper, Terror, and the Iron Fist.